Tourists are always on the look out for the homeless here, as though they were on a treasure hunt. When they spot one, they become unhinged, voraciously snapping photographs of them and even with them. That’s because, from the first day of spring until the end of autumn, with some breaks in the summer, the Chicago Parks Department dresses the city’s vagrant population in ghillie suits. 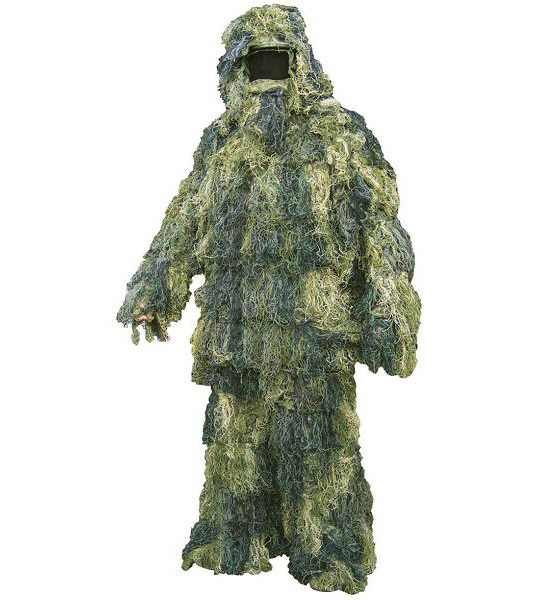 Looking like a cross between the Swamp Thing and Cousin It, a ghillie suit is a type of camouflage clothing worn mostly by snipers and hunters to blend into their surrounding. To enhance its stealth profile, the already shaggy garment is sometimes augmented with bits of vegetation found in the area. Once considered a nuisance, now the homeless in their ghillie suits are welcomed ornamental additions to the city’s public spaces. Before a stinking mound dozing off on manicured lawns; now a Picturesque hermit cocooned in his wearable hermitage. Before a pitiful blot on the street you always try to avoid eye contact with; now a mobile micro-garden strutting its vegetal spectacle alongside beautifully landscaped medians and curbside mini-Edens. Before when they came together to commiserate, they were loitering; now it's a pop-up Versailles.